Last week we learned that a leader who is being transformed by Jesus Christ is one who is increasingly and personally gripped by the power and wonder of grace; has experienced brokenness and mercy; and who treats others with similar acceptance, mercy, and love. View of God: Do I feel God is a harsh taskmaster who is distant, absent and hard to please? Or do I feel that God is my loving Father, my ‘Papa’ whose Son suffered death to rescue me and make me His own? Growth: Do I believe that the key to lasting life change is trying harder to please Him? Or do I believe the key to real transformation is a deepening relationship with the Trinity? Forgiveness: Do I always struggle with a sense of guilt, feeling like a failure before God? Or do I feel forgiven and deeply loved by God, my Savior? Holy Living: Do I believe that holy living isn’t important? Or do I believe holiness is important, realizing it is only possible as I walk with intimacy with God? Shame and Identity: Am I driven by shame and/or guilt? Or do I know I am a beloved child of God? Rules/Law: Do I believe that as Christians we need rules to keep going straight? Or do I know that we need God’s rules (not man’s) to continually bring us to the cross? Holy Spirit: Do I have no practical understanding of who the Holy Spirit is and how to walk with Him? Or am I learning to enjoy precious intimacy with God through the indwelling of the Holy Spirit? My “Boast”: Am I at times very proud of my gifts, abilities and accomplishments? Or am I proud of the great price Jesus paid to make people like me part of His family? Brokenness: Do I believe that “successful” ministry can only take place by ministering and leading out of my strengths? Or do I feel that “significant” ministry usually takes place by ministering and leading out of weakness, brokenness, and transparency? Attitude in Prayer: Do I feel that prayer is a burdensome duty that I feel I must do in order to please God or do I feel that prayer is a privilege? What keeps me “anchored” in environments of control? What fears? What past experiences, pressures or stresses? What aspects of my culture are barriers to change? What is holding me back from moving toward an environment of grace? What is God saying to me about changes I need to make regarding my lifestyle, ministry or leadership approach? 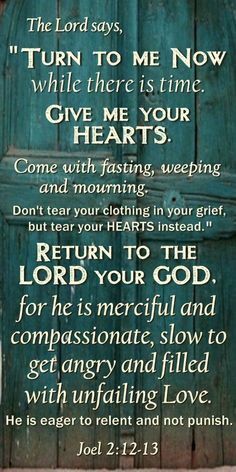 to live godly lives and in every way, to return to Him with all our hearts. 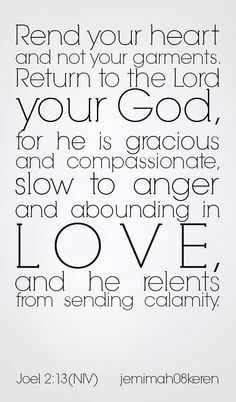 anger, abounding in loving-kindness and relenting from evil.